For Genealogical Research in the Central Pennsylvania Area or to learn how to begin researching your family, contact us. Do you need someone to research your family or provide a pedigree chart? Do you need someone to look over your research and help plan a strategy? Do you want to join Daughters of the American Revolutionn, Sons of the American Revolution, Sons of the Revolution Children of the American Revolution, Daughters of the Union Veterans of the Civil War, The Welcome Society, PA Society of the Cincinnati’s or any similar Lineage Society? 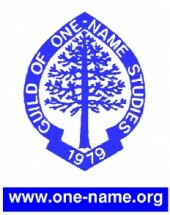 Do you want someone to research your First Family of PA lineage? Do you need to debunk that family story? Do you want someone to write a book about a family story or a brief history of your family? Brick Walls: Love Em or Leave Em? What’s in a Will I Don’t Already Know? Session 7: What’s in a Will I Don’t Already Know? 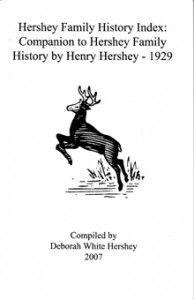 This is an index as a companion to the Hershey Family History by Henry Hershey written in 1929. This is an every name index and does not include place names. White Hershey, Deborah. History of the Browns of Northern Pennsylvania. Elizabethtown, Pennsylvania: Privately printed, 2004. White Hershey, Deborah, “Scotch Irish Pioneers in Ulster and America” in The Derry Press, Hershey, Pennsylvania: Privately printed, 2005. 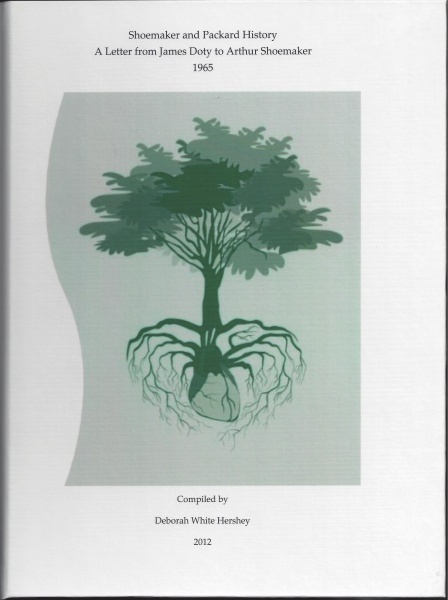 White Hershey, Deborah, History of Alexander Right and Mary Ella (Hess) White, Elizabethtown, Pennsylvania: Privately printed, 2005. White Hershey, Deborah. “Sawmills of Snedekerville, Pennsylvania”. The Settler: A Quarterly Magazine of History and Biography. Towanda: The Bradford County Historical Society. Nov 2005. 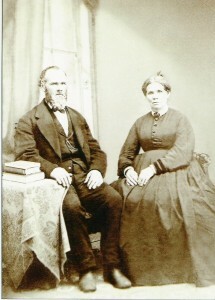 Agnes Taylor Sep. 21, 1823 66 yr.
James Taylor Oct. 11, 1842 58 yr.
Mary Gailey Jan. 19, 1865 63 yrs. 3 mo. 27 days. Wife of Alexander G. Gailey, Jr. Her husband was a nephew of Alexander Gailey the Revolutionary Soldier. David S. Garbaugh Jan. 29, 1893 42 yrs. Civil War Veteran Co. A. 40th Regt. Pa. Inf. John Thomas Branyan Jan. 8, 1976 94 yrs. Travel Charges – 1 hr. Lineage Papers – DAR, SAR, SR – Same as Extended Central Pennsylvania Research, plus $10.00 for final application. Deposit of $300 ($60.00 x 5 hrs. required, to apply to number of hours you have requested. Further hours will be billed periodically at predetermined intervals. The client should set a maximum number of hours. Additional hours will be require a new contract. Progress reports for longer projects will be sent at monthly intervals. Unforeseen additional charges may occur and will be the responsibility of the client. These may include subcontracts, for requests that take me outside my expertise. This will be discussed with the client ahead of time for permission to continue. Computer searches, library searches, visits to Courthouses, visits to archives, telephone calls, visits to other repositories and discussions with relatives will be used throughout my research. A full research report and supporting documents will be provided as well as some analysis. If you are looking for someone to search for specific records at courthouses, archives and historical societies, call for pricing. I will provide assistance with DAR (charge regular rate for supplementals, prospective members $10.00 only for finished application), SAR, CAR, SR, First Families of Pennsylvania applications and research. Remember that with some custom research and record look-up investigations, there are some cases where my research may result in no documents being discovered.